Rock Hudson was the definition of a movie star: tall, dark, and handsome, he epitomized American manhood at the pinnacle of his fame in the 1950s and '60s. America's leading man exuded charm, strength, virility, and charisma in classics like Magnificent Obsession, Giant, and Pillow Talk, and was frequently paired with Doris Day. His mainstream appeal translated into box office success during the last hurrah of Hollywood's Golden Age. Perhaps Hudson's greatest performance came in real life when he kept his authentic self and his sexuality secret in what was then an extremely homophobic society. Mark Griffin probes beneath the facade to craft the definitive biography of Hudson in the new book, All That Heaven Allows. There are more than 100 interviews with co-stars, family members, and former companions and unprecedented access to private journals, personal correspondence, and production files to produce this multidimensional portrait of one of the most compelling figures in film history. Hudson was a complicated and conflicted individual, ultimately a widely misunderstood icon whose illustrious career spanned 40 years and he was the first major celebrity to die of AIDS. "On the second day of October in 1985, there was no shortage of newsworthy events happening around the globe," Griffin writes of Hudson's passing. "Soviet leader Mikhail Gorbachev had made his first trip abroad. An Israeli air raid on PLO headquarters had killed sixty-eight people. In southwest Sudan, a train carrying famine relief supplies had derailed. While all of these stories warranted international coverage, there would be bumped off the front pages by another headline - the death of a movie star. 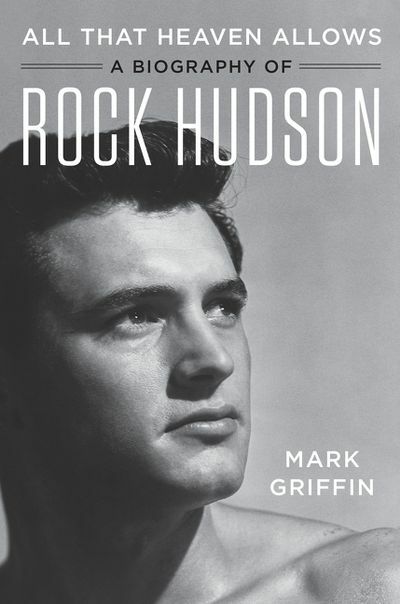 Rock Hudson, who had appeared in over sixty feature films and defined all-American manhood for an entire generation, had died of AIDS-related causes at the age of fifty-nine. "On television, images of Hudson saturated not only the likes of Good Morning America and Entertainment Tonight but all of the network news broadcasts. The tributes included glimpses of Rock in his matinee idol prime - punching out James Dean in Giant; making out with Doris Day in Pillow Talk. These classic clips were intercut with footage of Hudson at a press conference just three months earlier when he reunited with Day to publicize her new cable series, where Rock was almost unrecognizable - gaunt, glassy-eyed, and disheveled. Although Hudson had been the most photographed actor of his generation, it would be these heartbreaking final images of him, looking ravaged and cadaverous, that would remain lodged in the public consciousness." Griffin's exhaustive research begins with Hudson's chaotic and financially strapped Midwestern childhood having to endure an estranged father, a violent stepfather, and a controlling mother. A young Roy Fitzgerald found escape from his troubles at the local cinema and yearned for a future onscreen. Looks and drive, as well as his stint on the casting coach with a notoriously unscrupulous agent, eventually made his dream a reality. An unskilled by fiercely ambitious former truck driver was transformed into the camera-ready persona known as Rock Hudson. As he rose through the ranks at Universal, Hudson emerged as the studio's prized asset, a clean-cut matinee idol adored by colleagues and fans alike. Professional success took a psychological toll on this vulnerable, insecure soul. On screen and in gossip columns, he wooed numerous beautiful women, burnishing his manufactured image as a swoon-worthy romantic hero. Offscreen, he courted disaster as his gay relationships, affairs, and flirtations made him a prime target for exposure by tabloids and spurned ex-lovers. There are fresh insights into Hudson's controversial marriage to Phyllis Gates and his contentious dealings with boyfriend Marc Christian, providing answers to questions the late actor consistently avoided. Griffin also offers the first in-depth analysis of Hudson's entire body of work from his early bit parts to his collaborations with visionary director Douglas Sirk to his cheekily subversive bedroom farces with Doris Day, and his transition to the small screen int he hit series McMillan & Wife. The A-list cast of characters featured in this Hollywood story include Elizabeth Taylor, James Dean, John Wayne, Judy Garland, Marilyn Monroe. 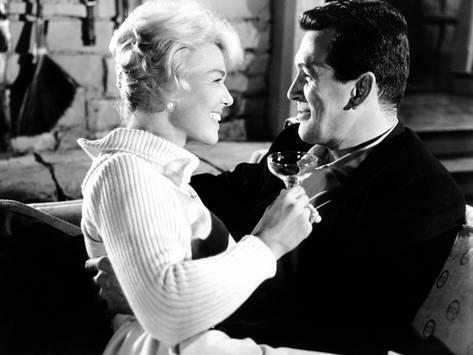 Doris Day and Rock Hudson in "Pillow Talk." Griffin writes of Hudson and Day's first comedy, Pillow Talk, "'No one wanted to book it,' remembered producer Ross Hunter. 'The big movie chains all sadly told me, after seeing the picture that sophisticated comedies like Pillow Talk went out with William Powell. They also said that Doris and Rock were things of the past who had been overtaken by newer stars.' In hindsight, it's hard to believer that the same Oscar-nominated Pillow Talk that grossed $7 million, unfastened Doris Day's cinematic chastity belt, and allowed Rock Hudson to play gay on-screen was considered hopelessly passe by America's theater exhibitors. "And though it seems inconceivable now, after making more than forty feature films, Hudson had never once appeared in a bona fide comedy. After slogging through A Farewell to Arms, Twilight for the Gods, and This Earth Is Mine, Rock - like his devoted fan base - was desperately in need of a good laugh. Even so, when Hudson was first presented with a script entitled Pillow Talk, he was apprehensive. Considering how hard he had worked to be taken seriously as an Oscar-nominated dramatic actor, would appearing in a suggestive sexcapade single-handedly negate years of time and effort? Then, too, what if he just wasn't funny? Hopefully, the script would be amusing enough so that nobody would notice. "The screenplay by Stanley Shapiro and Maurice Richlin concerned Brad Allen, an oversexed songwriter who woos assorted Eileens and Yvettes with romantic ditties he's custom-tailored especially for them. Brad's constant crooning over the phone incurs the wrath of Jan Morrow, the demure interior decorator with whom he shares a party line. As disembodied voices, they squabble ferociously, but once they meet in person there are sparks of a different kind. "Every great couple need a third wheel and Broadway's Tony Randall would play Day's uptight suitor, the kind of never-gets-the-girl tole unsually inhabited by Ralph Bellamy or Gene Raymond. Before being cast in Pillow Talk, Randall had recently starred in both the stage and film versions of George Axelrod's satire, Will Success Spoil Rock Hunter? (which had originally been titled Will Success Spoil Rock Hudson? to Rock's great delight)." All That Heaven Allows has earned its place as one of the greatest Hollywood biographies ever, as it illuminates an all-too-human superstar whose life and legacy have significantly influenced American culture.